A historic event is taking shape along the Potomac River just outside of Washington, DC. A magnificent state-of-the-art facility will be built to honor America's Soldiers, preserve the history of America's oldest military branch, and educate all Americans about the Army's role in our nation's development. The Museum, scheduled to open in 2013, will be the US Army's national landmark. Fort Belvoir, Virginia, one of the country’s most prominent defense installations, will be home to the new National Army Museum, which is scheduled to open its doors to the public in 2013. 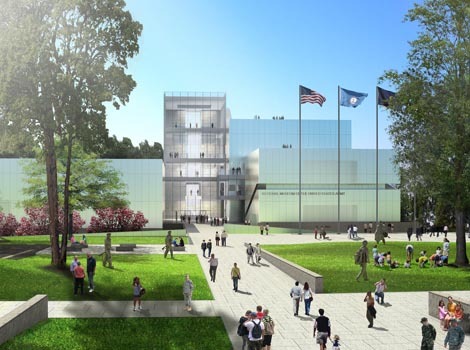 The centerpiece of the National Museum of the United States Army will be a major exhibition facility where the stories of Army Soldiers will be joined with thousands of artifacts, documents, and images tracing the colorful history of the United States Army from colonial times to today. A series of chronological galleries and thematic galleries will show visitors what it means to be a Soldier in times of both war and peace. Galleries will show the Army’s strength as an agent of peace and nation-building. Soldiers have conducted countless missions in the areas of exploration and discovery, science and technology, communications and cooperation, and recovery and disaster relief. The ingenuity of American Soldiers has greatly aided the nation’s progress and prosperity during more than 230 years.